As the name suggests, this procedure involves usage of hot water for extracting the dirt. The task is accomplished with a special machine that gives off steam and sprays detergent on the fibres. The hot water and detergent react with each other and start forcing out the contaminants. After that, a wet vacuum is used for sucking up the dirty water. Hot water extraction is generally chosen by people concerned about the adverse effects of chemicals used in some cleaning methods. Certain chemicals utilised to cleanse carpets can have a serious impact on human health and indoor environment. Carpets cleansed using this technique can take anywhere from 12 to 24 hours for drying completely. However, professionals make use of special machines containing more power to speed up the drying process. The method of dry cleaning for carpets involves zero usage of water. It is done by placing special solvents or chemical compounds on the fibres that cause soil present inside the carpet to break down. There is no need to wait for drying, and the floors can be used almost instantly. That is why, most retail and industrial settings choose this method for imparting a fresh feel to their carpets. 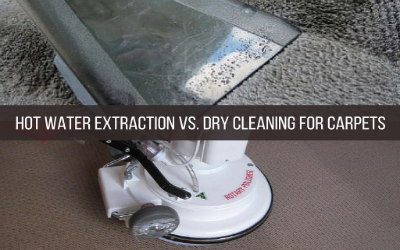 Hot water extraction is not the best solution for commercial settings that need a quick cleanup job for dirty carpets. However, it goes deep into the fibres and ensures a thorough cleansing. On the other hand, the chemicals used in dry cleaning can sometimes be harsh and emanate strong odours for a long time even after the task of cleaning is complete. One must, therefore, ask the professional he or she hires for getting the job done about the kind of products they will be using. The most prudent thing would be allowing the professionals to inspect the carpet fibres so that they can suggest the most suitable method. For more information about different types of commercial cleaning services, stay connected to our blog.